It's raining mid-size SUVs! 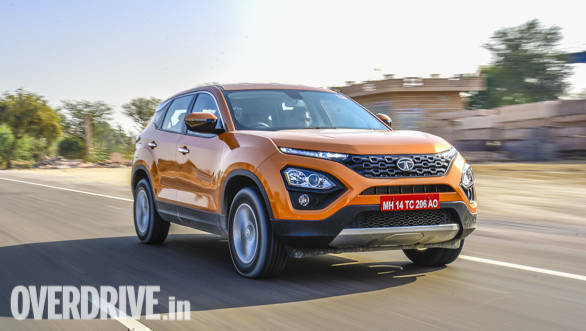 Close on the heels of the launch of the Nissan Kicks yesterday, Tata has launched its much-awaited Harrier in the Indian market with prices starting at Rs 12.69 lakh, ex-showroom. The Harrier is the new flagship from Tata and the most premium SUV to wear to the Tata emblem. Those credentials come courtesy of its new-age styling, premium materials in the cabin and the mechanicals that underpin this mid-size SUV. The styling follows the new trend of placing the headlight units in the bumper element and putting sleek DRLs in place of the conventional headlamps. Similar styling will soon be seen on upcoming compact SUVs like the Kia SP/Tusker, and the Qxi and Kona EV from Hyundai. The Harrier's spacious cabin boasts of comfortable seating for five, premium soft-touch plastics, faux wood inserts, perforated leather upholstery, a best-in-class 8.8-inch touchscreen infotainment system, and a 425l boot. The mechanicals create headlines for the Harrier, thanks to the platform derived from Land Rover Discovery Sport and the Kryotec 2.0l diesel engine that belongs to the same family as the Multijet 2 diesel engine that powers the Jeep Compass. The engine runs a lower state of tune though - 140PS@3,750rpm/350Nm@1,750-2,500rpm and is available with a six-speed manual transmission only at the moment. An automatic and an all-wheel-drivetrain are also in the pipeline. Despite having drum brakes at the rear and a manual transmission, the engine is mated to a Land Rover inspired multi-terrain electronic traction control system called Terrain Response and it does work quite well. Later this year, Tata will also showcase a seven-seater variant of the Harrier, which is expected to sit on a longer wheelbase. The five-seater variant launched today has a wheelbase of 2,741mmm, which is similar to that of the LR Discovery Sport. The Harrier will be available in four trim choices - XE, XM, XT and XZ, and the top two trims will come with 17-inch alloy wheels as standard. The Harrier comes with six airbags, ESP, ABS with EBD and a reversing camera as a part of its safety kit. We drove the prototype of the Tata Harrier last year and were quite impressed with what the car has to offer. The pricing, though introductory, is just as well-planned as the car itself. Its natural rivals by intent are the Jeep Compass, the Mahindra XUV500 and Tata's own Hexa, while the pricing puts it into contention with mid-size crossovers like the Nissan Kicks, the Renault Captur and the king of the segment - the Hyundai Creta.